For most of the journey the bus has been a in various states of disarray from "where is the, oh there it is" to "I've been through the bus three times and still can't find it." Much of this disorganization came from the fact that none of us on the bus are particularly organized, but some came from external sources. All the oil we started with forced us to stow personal items and living quarters supplies in non-optimal places. As we used the buckets of oil and disposed of them, we regularly shuffled items around to improve our comfort and ease of use. As more buckets disappeared everything else seemed to expand. Demonstrations that came out less often didn't always get packed away as efficiently as they were the first time. We were invited into homes and upon leaving, didn't pack away things as nicely. Then there was the oil. Transferring oil is never a totally clean operation. Oil is sticky and clings to the pump, to the buckets; every so often a little bit spills. This mixes the grime that accumulates from getting in and out of the bus. The large demonstrations on the floor of the bus also made hard to clean it up. The bus was messy and dirty. Then Erik said he wanted people to go through the bus. Before all that, we went to the Sciencenter. The Sciencenter is a science exploration museum with displays and interactive exercises to explore different phenomena. The staff was great and super helpful. I, however, nearly created a disaster. The room was a mini amphitheater with a tiny stage. We placed our prop table on the edge of the stage. We were down in the aisle of the first row. I tried to climb up to grab a prop behind the table. The whole table slid, and I nearly took a tumble. I can't figure out what I was thinking. When I set up the table, I could feel it slide, and I knew it wasn't stable. The rest of the day was quite busy. Eric was throwing a kick-off information event for a new Physics Factory project. As part of the information session, he asked Bruce and I to put on a show and let people in the bus. This meant the bus badly needed to be organized. The bus was relatively clean, but personal items were scattered about, and it was kind of messy -- we had been on the road for over a month. The event was held at Ithaca Generator. In order to clean up the bus, we decided to pull every demonstration off. This one night had more demonstrations ready to go that I have ever seen and Bruce can recall. We had a few demonstrations that we still hadn't used on this trip. They either took too much time or too much space, but today was the day everything came out. In addition to the regular floor show, we had the large harmonograph, the siphon race, the Coriolis machine, the coupled pendulum and dodecahedron all set up. We took up a lot of space in the parking lot, and the bus looked so spacious. The night was a little chaotic because all these demonstrations were out, and for a while I was the only facilitator. Even with Bruce around, there was always someone trying something a little unsafe. Normally, I think of this behavior as juvenile, because kids are used to things designed not to hurt them and tend to play hard until someone gets hurt, but this time I was heading off adults from irresponsible behavior far more often than children. It highlighted the importance of facilitation for demonstrations and field testing to see how people can abuse and misuse them. Lessons learned, and no one got hurt, so the event went great. Happy Mother's day. Before heading out of town, we had Eric fiddle with the ignition, and lo and behold, he was able to reinstate two features. The backup beep works again (maybe for the first time in years), and the bus starts up much more easily. We are off to Pittsburgh. drive to Troy, NY where I met the Bruce's parents. very existence came into being because of the enticement of good food. confidence and motherly manner made me see how she had acquired so many adventures. department and just about to give his first job talk, a voice called out from the back. "Hi, Brucie!" Phillip, Bruce's brother, had found about the talk and came up to watch; according to Bruce most of the audience members were Phillip's friends. Bruce tells the story with his usual entertaining flair, but it is a time when he confesses to being flustered. Everyone who knows Bruce knows he easily adapts to adversity and moves on, but it is great to know that it is a learned skill, and we can all learn to deal with adversity as happily as Bruce does. Along our journey I got to meet Rachel and Fiona, sisters to Bruce, and both always called him Brucie. Then on our arrival to the house, Bruce sang out "Hellooo, is anybody there?" Helen's lyrical reply was one I cannot remember, but "Brucie" was in it. one of with four spoons. the details as possible and maybe decide which details to leave out. Tuesday 6 May: Bruce is blogging for the first time! I woke up as the sky in the East was beginning to lighten - a habit I acquired from my high school teacher wife Elena. 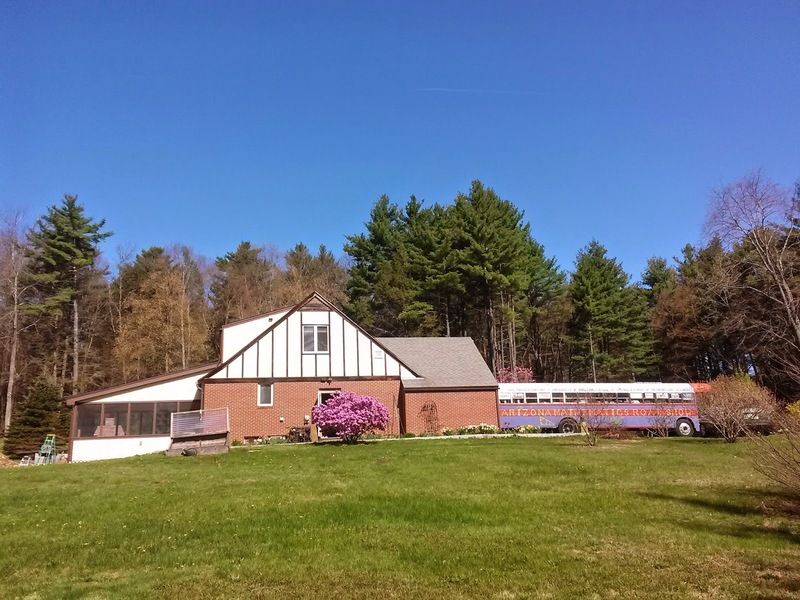 Shane and I were in the Bus at the home of Anne Tisdale-Ashford and her husband Jonathan in Concord MA - very close to Boston but far enough to be set out in beautiful farm country. We slept extremely well after last night's supper of a delicious "country chicken" stew - warm in our sleeping bags even though the outside temperature was predicted to be in the 30's. It wasn't fun getting out of warm sleeping bags in the pre-dawn chill, but I felt that it would be good to start earlier than later, as Boston rush hour has the reputation of being tough. We got started around 6:30; traffic was already busy on Route 2 East but not yet congested. Unfortunately the vegetable-oil fuel system was! It turns out that on cold mornings, the oil is reluctant to move quickly, even with all our heat exchangers, and on the first big uphill the engine shut down. Not very convenient! But it as a matter of moments to coast onto the shoulder, and a couple of minutes to re-prime the fuel system - then we drove the rest of the trip on regular diesel fuel. 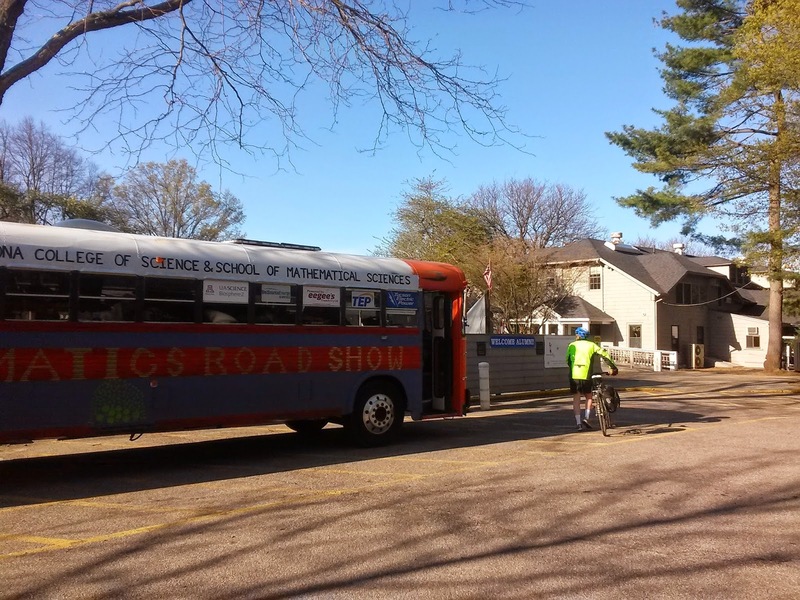 We arrived at the Shady Hill School before most of the staff, but Kim found us and put us in the capable hands of Tim, who showed us where to park and unload. Well worth getting there before parents started arriving and dropping off children! Our host Erika helped us get set up, and we were warmly welcomed by Mark, Alison, and many more teachers whose names went in and out of my head. Our venue was the venerable Assembly Hall that appeared to date to the founding of the school 100+ years ago - high ceilings and massive beams, it was the most majestic room we've presented in on this trip. The presentation itself was delightful - about 250 middle-school students in grades 5-8 sitting on the wooden floor. This can be a difficult age range if there's any tendency among older students to be more concerned with whispering to their friends than watching the experiments. But not this group! They favored us with our attention from the first moment and got more and more into the presentation as it progressed. Afterward a teacher (whose name I forgot) said that having the middle school students on the same campus as the elementary grades encourages the older kids to adopt responsible behavior as models for the younger ones. I'm not sure if this would happen everywhere, but at Shady Hill it works just fine. A note of thanks to our sponsor: THANKS to Lee Herbst for connecting us with Shady Hill School! You should be receiving some appreciative letters and emails from students and teachers. From Shady Hill we drove south to the rural town of Pembroke, home of Dolly's friend Richard Edlund. Like Dolly, Richard is a graduate of the Boston Museum of Art School, and he had a distinguished 30 year career in commercial art - the Pep Boys logo of Manny, Moe, and Jack being one of his better-known designs. In retirement he drew the whirling-bus logo of the Arizona Math Road Show that we are sure will become just as famous! Richard's house is a vortex of creative energy, full of his artwork and musical instruments - plus a bust of the cartoon character The Tick, created by Richard's son Ben! We tore ourselves away to start - finally! - our journey westward back to Tucson. We had been graciously invited to stay with Robin Sherman, a college friend of Bruce's wife Elena Martin. Robin and her husband Rob live in a lovely renovated farmhouse in Deerfield MA, in the foothills of the Berkshires. We wanted to help her prepare dinner, but she firmly directed us to stay on the spectator side of the kitchen counter. Just as well, as she whipped up chili and cornbread in a controlled whirlwind of activity that we could not possibly have survived! However she did let Shane bake his trademark oatmeal-chocolate chip cookies afterward - on condition that he replace the chocolate chips with cranberries in half the batch. Not a bad bargain! With the early start and nonstop activity throughout the day, plus the wonderful supper, we could not stay awake until Rob came home. Robin set us up with extremely comfortable beds, and we slept extremely well. We left Devin at the Omega institute in New York in the hands of good friends. We were sad to lose him but glad that he received such a warm welcome by the staff Devin will be working with for the rest of the summer. I cannot mimic Devin's storytelling style, so I will not try. But I hope to capture some of those same moments that have made impressions on us and that highlight the excitement of the trip. Monday, Bruce and I went to Boston. Bruce took the opportunity to visit M.I.T., where he was graduate student “long long ago.” We discovered that it is very difficult to navigate Boston in a bus with Google maps. Bruce knew there were many low bridges in the area and a large number of parkways that are “cars only.” The extensive tunnels that move an amazing number of people in and out of Boston every day do no allow the GPS. System to know where you are. Google maps decided to reset the map to middle of Massachusetts when we were underground. The streets are so tightly packed that it is easy for the GPS to confuse which street we were on with an adjacent street and told us to make impossible turns. Google maps firmly believed we could make u-turns at will, and the bus had a turning radius of a compact car. This was far more apparent on our way out of town when Google maps did all of these things in quick succession, always rerouting us to roads that were cars only. Fortunately Bruce's thirty-year-old memory of Boston's roads prevailed. Between our ingress and egress to and from the city of Boston, we had the most amazing weather. We also found out that it is easy to park a bus in Boston at least if you know about the autopark. The Museum of Science doesn't allow buses to park on site, but they do have directions for where to find bus parking. This information was not easily found anywhere else in my search of the internet, so I thank the content manager of the Museum of Science web-page. Having parked the bus a stone's throw from Bunker Hill, we rode our bikes right past ignoring its tourist appeal. Likewise the U.S.S. Constitution was just around the corner, but we pedaled our way over to M.I.T. Bruce grew nostalgic as we wandered the halls, and stories poured forth both while cycling and walking around the campus. One story that made the already ebullient Professor Bayly light up was the one about a prank measuring the Massachusetts Ave Bridge over the Charles River in Smoots (The length of Oliver Smoot who was supposedly to inebriated to notice his fraternity brothers moving him along the bridge and marking off his lengths in chalk) where it was 364.4 Smoots plus or minus an ear, which was part of the great lore of M.I.T. pranks that he learned of on his first week on campus. We found our way to the food trucks outside the medical center where many years ago Bruce said there was one falafel truck and “it wasn't very good, but it was close and it was the only one.” We had a chickpea fritter sandwich (Yes I think that is falafel, but they called it a chickpea fritter sandwich) and rosemary fries from Clover. The food was great in scale and flavor. One sandwich easily fed us both. There are many stories to tell, but it has grown late, and another day will soon be upon us. I must say thanks to: our host at M.I.T, Bruce's former student Martin Bazant who allowed us to sit in on a lecture on ion particle dynamics in an quasi-neutral medium, and Anne Tisdale-Ashford and Jonathan Ashford who opened their home to us, plied us with food and drink, told wonderful stories and introduced us to new friends and future scientists. Tomorrow the physics factory rides again with an event at the Shady Hill School in Cambridge, MA. Dear readers, this is my last earthbound broadcast, so to speak. With that said, there is more that I must put in after the fact, but I have greatly enjoyed the past few weeks of informing each of you as to the whereabouts of the Arizona Mathematics Road Show. Starting out on a cold and wet morning Thursday we prepared to do the impossible. There is an old saying that the truest test of a mad man is getting him to park a school bus on the street in the Lower East Side (LES). Well, even if that's not a saying, it should be: today we were going to attempt to park the bus outside of the LES Girls Club. Now, the brief version of the history of the club is that New York has had plenty of Boys Clubs but never anywhere for a girl/young woman to go that offered the same benefits. So, pretty recently, several folks took careful note of this imbalance and decided to address it with dedication. The newly bought club features classrooms of an incredible variety: everything from workshops, to kitchens, and even a planetarium. I digress, the insides of the building are expansive, but it is rather small on the outside, so our parking became a fearsome obstacle. It took us two full circuits around the block in order to find somewhere long enough to park without getting a ticket. Length aside, we now had to worry about whether we would be blocking off an entire street. Our estimation was that traffic would still be able to make it through the gap, so we went off to spend our day in the city before the performance. Still, I think we took the last parking spot in Manhattan. Back at the Girls Club of New York, we traded our demonstrations for their marvels. Of course I don't mean literally an exchange of materials, much more like cross pollination. We did two brief shows, and I thought both of them went extremely well. The second one was a performance for young women who are older than our usual audience, so I was delighted when the initial wall of cool crumbled and fell, leaving eyes bright with curiosity. We even had the chance to take a trip out to the edge of the galaxy and back before the end of the day via the planetarium! After our busy day, we caught dinner with some of Shane's friends from Tucson and then returned to our roost in New Jersey. On Friday we all split up to pound the streets of the city. My Dad was mostly interested in visiting sites of his old stomping grounds; I went down to the pier in Queens to visit a friend's performance space; Shane and his girlfriend went back to the Museum of Natural History to try to get a grasp on the tourist side of the institution. Later in the day, I met with my Dad at the Museum of Mathematics in what can only be described as a feat to telepathy: without any communication, after parting ways on the subway, we arrived within five minutes of each other at the museum. We looked around for a while, and then walked down to a party with some math folks he had known 30 years ago. The day sure filled itself up nicely. The two of us caught a train back to the Jersey suburbs and pretty quickly found ourselves asleep in beds upstairs. Saturday broke upon us, and we drove out to host a booth at a miniature STEM convention in Larchmont, NY. The whole event was happening at a middle school in the town, and apparently it was fairly large: something like 2000 people showed up for the gathering. We started at 1:00pm in this wonderfully spacious area. The whole five hours would have been nothing but an excellent send off for me if I had not been in the process of losing my voice. As such, I had to time my explanations around hovercraft launches. 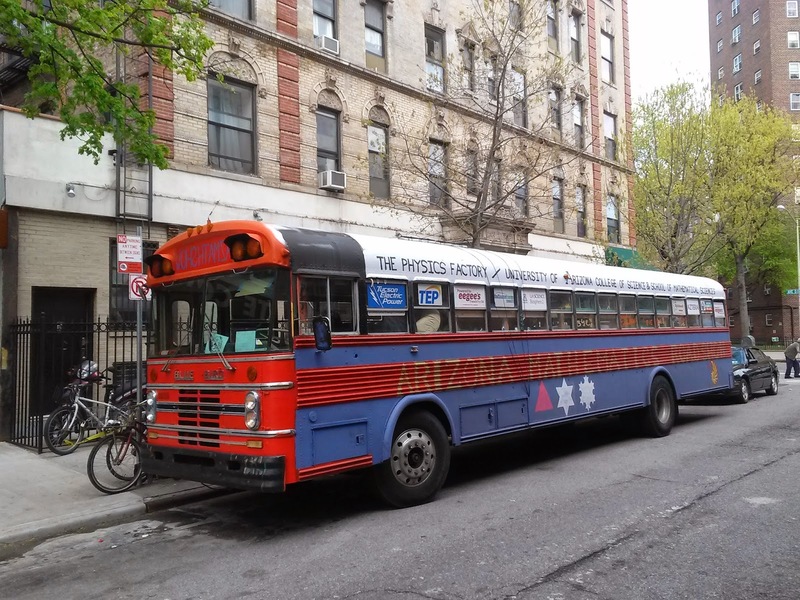 I won't forget to mention that we were joined by the people in charge of the illustrious Bio Bus! But, like anyone with a bus knows: if you have a bus, you will have engine trouble. This seems to be some sort of natural law. Anyway, they were not taken by surprise, and managed to bring several microscopes in a Subaru, and put on quite a show of force at the mini-convention. However, I was heartbroken, because I had been planning for some time that I would have the chance to duct-tape a harmonica to their front bumper, and now that opportunity must wait another 18 months. We drove for the rest of the day, and presently arrived four minutes from my site of departure. 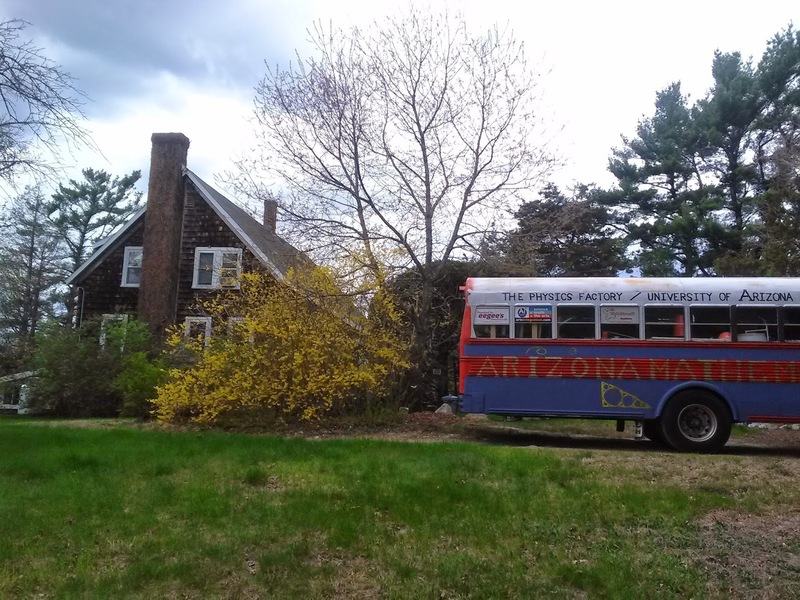 Naturally, I write this all hours after the bus has left the parking lot of the Omega Institute for Holistic Studies, so this is my last broadcast, like I said before. Thank you all for following us on our journey, and please don't be too rough on Shane, because he is picking up where I left off. We nearly sheared off the top of the bus going underneath a nine foot bridge on the way to the Taconic State Parkway. Some sort of misinformation. The rain came down. Yesterday's weather seems determined to wash the east coast into the sea, and each of us couldn't help but wonder if we were in for more. We woke up where we were staying in Rehrersburg, PA, and the rain hadn't let up an inch. In fact, the drops were getting thicker, and the air inside the bus was cold enough for us to see our breath. We were forced to huddle under whatever blankets we could throw together, and that still didn't keep us completely comfortable. This was an unusually dreary day, but at least the bus was behaving itself. I would like to point out the operative word here in the last sentence is the “was.” Our plan was to spend some time at the Liberty City Science Center in New Jersey, but apparently our engine had different plans. After being on the road for a couple of hours, we started to lose power again. According to my Dad, the engine trouble the day before was due to our diesel filter, but now our veggie oil filter was all blocked up. He replaced our used filter, but there was something else keeping us from maximum throttle. So, we pulled into a Love's truck stop and got large hot chocolates while we figured out the next step. We decided to do a quick engine oil change, and soon realized that due to the temperature outside, quick was not an option: the viscosity of the oil was so high that we could only pour in half cup increments every thirty seconds, or the funnel would overflow. The flip side of this slow drip was that we got to eat a nice hot lunch of soup and Shane's world- famous wraps. Following lunch, we did a quick meeting of the minds and agreed that this precipitation just about had us beat. In a multi-stage effort to rally against the damp, we bought ponchos, snacks from Trader Joes, and called off the Liberty City Science Center visit. As the last part of this plan we got in touch with another of my Dad's old students and then drove to his house. Fortunately, we are now indoors and quickly drying in the company of friends! Even though the engine is a great hot object, we were not able to harness its waste heat for the inside of the bus, because the air and moisture whooshed in from the undercarriage. I just heard that there is a flash flood warning until 10:00pm tonight too. The folks at the Lower East Side Girls Club reserved this spot for us on 7th street by Avenue D. It was exciting getting a 40 foot bus around the Alphabet City section of Manhattan on street sweeping day!